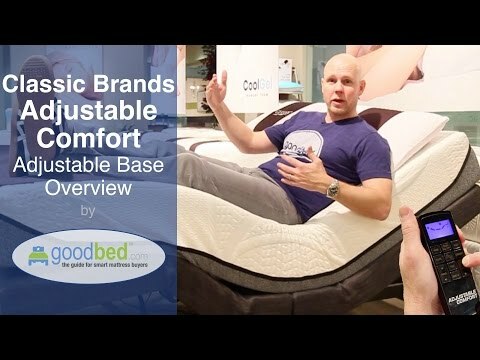 GoodBed's simple explanation of the features and functionality of the Classic Brands Adjustable Bed. Classic Sleep Products has always been known as a leader in finding innovative new ways for people to sleep in a healthier way. We are committed to continuing that tradition and will always be on the cutting edge of producing innovative ways for people to sleep in a healthier way. Our sleep systems are designed to help you get the maximum benefit out of each night of sleep. The PostureTemp Luxury Memory Foam line has 20 ratings and 0 reviews on GoodBed. The Classic Brands Natural Sleep line has 8 ratings and 0 reviews on GoodBed. The Classic Gel Foam line has 9 ratings and 0 reviews on GoodBed. The Classic Latex Foam line has 18 ratings and 0 reviews on GoodBed. The Classic Memory Foam line has 72 ratings and 0 reviews on GoodBed. The Classic Sleep Hardside Waterbeds line has 91 ratings and 0 reviews on GoodBed. The Classic Sleep Natural Expressions line has 6 ratings and 1 review on GoodBed. The Classic Sleep Restapedic line has 2 ratings and 0 reviews on GoodBed. The Classic Sleep Softside Waterbeds line has 95 ratings and 0 reviews on GoodBed. The Classic Sleep Space Age line has 8 ratings and 0 reviews on GoodBed. The PostureCloud line has 2 ratings and 0 reviews on GoodBed. Classic Brands mattresses are recommended by 82% of owners on GoodBed (based on 415 ratings + 2 reviews). Do you have something to say about your Classic Brands mattress? Write a Review! There are 415 ratings on GoodBed for Classic Brands, but no reviews yet. Be the first. Classic Brands is a mattress manufacturer founded in 1971 that is based in Jessup, MD in the United States. Classic Brands is also known as Classic Sleep Products. The company was restructured through a bankruptcy filing in January 2010. Classic Brands is owned by the same parent company as Dormia. Additional product details can be found by viewing discontinued mattress models from Classic Brands. Have an update or correction to our information about Classic Brands? If so, please take a moment to suggest an edit. Showing stores with Classic Brands products nearest to Cambridge, MA. Call store first to confirm availability.